This genus is accepted, and its native range is Europe to Arabian Pen, Africa. Trees, shrubs, or sub–shrubs, usually much branched with flexuously ascending sterns. Leaves normally in whorls of 3–6 (3–4 in the F.Z. area), or occasionally spirally insertedd, very small, the margins usually revolute and meeting in the centre line on the under side of the leaf to form a sulcus. Inflorescence normally consisting of capitate clusters of up to 20 flowers on the tips of the branchlets, but sometimes spicate with the flowers in the axils of leaves on branches whose vegetative growth may continue after flowering. Pedicels short and 1–flowered, normally bearing 1 bract and 2 opposite bracteoles, but sometimes either the bract or the bracteoles, very rarely both, missing. Calyx and corolla actinomorphic and hypogynous. Calyx segments 4, free or fused to a greater or lesser extent. Corolla globular to tubular, 4–lobed, the lobes usually appreciably shorter than the tube, in the F.Z. area rather to very small, always less than 1 cm. Stamens normally 8, rarely fewer (4–7) or more (12); filaments free, insertedd on a hypogynous disc, often geniculate below the anthers; anthers often with appendages, dehiscing by lateral pores. Ovary 4 (8) loculate, placentation axile. Style 1, more or less expanded at the apex. Fruit a cartilaginous loculicidal capsule contained within the persistent calyx and corolla. Leaves in whorls of 3 or 4 (always 3 in the F.Z. area), very small, the margins reflexed. Pedicels short and 1–flowered, normally bearing one bract and two opposite bracteoles, but the bracteoles sometimes absent. Inflorescence consisting of clusters of flowers at the tips of the branchlets. Calyx and corolla hypogynous, tetramerous. Calyx actinomorphic, segments free to the base. Corolla crateriform to campanulate to slightly urceolate, or tubular below and campanulate to crateriform above, actinomorphic or when a tubular portion is present this is often somewhat bent. Stamens 4; filaments free, inserted on a hypogynous disc; anthers often with appendages, dehiscing by lateral pores. Style 1, somewhat expanded at the apex. Shrubs or subshrubs to about 1 m. tall, much branched with slender and flexous stems often with many dwarfed side branches in the axils of their leaves. Much branched trees or shrubs with flexuously ascending stems. Leaves in whorls of 3 or 4, very small, the outer margins reflexed, normally to such an extent that they meet along the mid–line of the under side of the leaf, forming a sulcus; often glandular at the tip and along the apparent margin. Flowers small, in capitate clusters of up to about 12 flowers, but usually fewer, at the tips of the branchlets. Calyx and corolla hypogynous, 4–partite, occasionally 3–partite in some flowers, regularly 3–partite in some species not in the F.Z. region. Calyx with one sepal longer than the others, and this sepal usually free and leaf–like at the tip, other sepals connate to a variable extent, sometimes leaf–like at the tip. Corolla actinomorphic, campanulate to urceolate, not deeply cleft, lobes obtuse. Stamens in one species 4 and opposite the calyx lobes, in the other species (5) 6–8 (10), anthers without appendages, in some species connate, in others free, opening by narrowly elliptical pores on the outer side of the upper part of each lobe. Style 1, expanded at the apex normally into a disc bearing the stigmatic surfaces on its upper side, but in one species in the F.Z. region expansion at the tip of the style broadly conical and the areas bearing the stigmatic surfaces somewhat depressed. Much branched shrubs or sub–shrubs with slender branchlets. Leaves in whorls of 3 or 4, very small, acicular, the outer margin reflexed and meeting in the mid line on the under side of the leaf. Flowers small, in capitate clusters of 3–16 at the tips of the branchlets. Calyx with one sepal longer than the other 3, leaf–like, free and inserted immediately below the others. Calyx and corolla tetramerous, hypogynous and persistent in fruit. Corolla actinomorphic, campanulate to tubular. Stamens 4; anthers with appendages. Style slender; stigma narrowly to broadly infundibuliform. Ovary globose, quadrilocular, capsule loculicidal. Erica accommodata Klotzsch ex Benth. 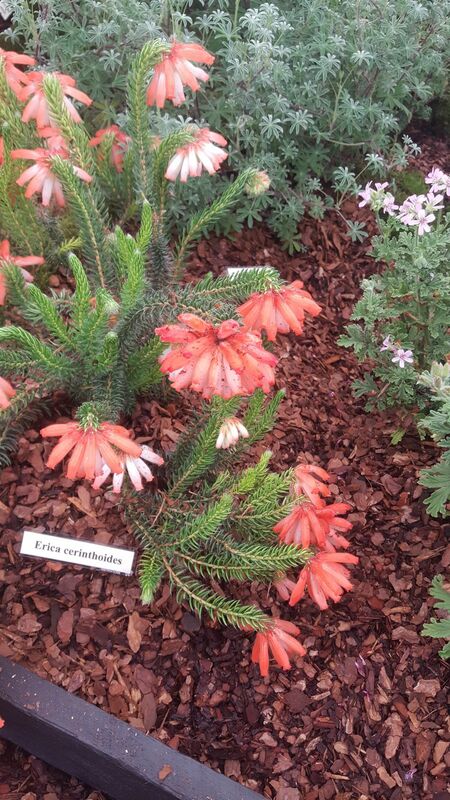 Erica albescens Klotzsch ex Benth. Erica amalophylla E.G.H.Oliv. & I.M.Oliv. Erica andringitrensis (H.Perrier) Dorr & E.G.H.Oliv. Erica annalis E.G.H.Oliv. & I.M.Oliv. Erica armandiana Dorr & E.G.H.Oliv. Erica armata Klotzsch ex Benth. Erica aspalathoides Guthrie & Bolus ex Schltr. Erica austronyassana Alm & T.C.E.Fr. Erica barnettiana Dorr & E.G.H.Oliv. Erica baroniana Dorr & E.G.H.Oliv. Erica benguelensis (Welw. ex Engl.) E.G.H.Oliv. Erica bojeri Dorr & E.G.H.Oliv. Erica boutonii Dorr & E.G.H.Oliv. Erica cavartica E.G.H.Oliv. & I.M.Oliv. Erica ceraria E.G.H.Oliv. & I.M.Oliv. Erica chamissonis Klotzsch ex Benth. Erica comorensis (Engl.) Dorr & E.G.H.Oliv. Erica constantia Nois. ex Benth. Erica cryptoclada (Baker) Dorr & E.G.H.Oliv. Erica cymosa E.Mey. ex Benth. Erica danguyana (H.Perrier) Dorr & E.G.H.Oliv. Erica deliciosa H.L.Wendl. ex Benth. Erica demissa Klotzsch ex Benth. Erica densata Dorr & E.G.H.Oliv. 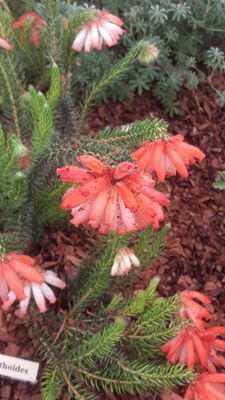 Erica dilatata H.L.Wendl. ex Benth. Erica erinus (Klotzsch ex Benth.) E.G.H.Oliv. Erica flacca E.Mey. ex Benth. Erica gerhardii E.G.H.Oliv. & I.M.Oliv. 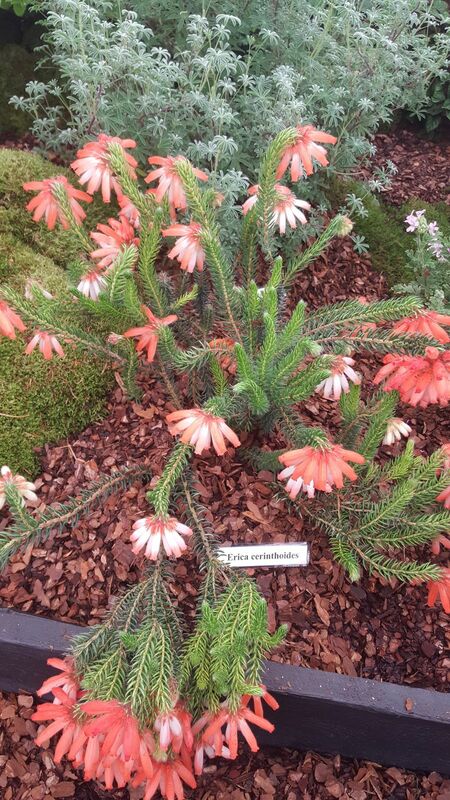 Erica gibbosa Klotzsch ex Benth. Erica gigantea Klotzsch ex Benth. Erica glumiflora Klotzsch ex Benth. Erica goudotiana (Klotzsch) Dorr & E.G.H.Oliv. Erica hebdomadalis E.G.H.Oliv. & I.M.Oliv. Erica hebeclada Dorr & E.G.H.Oliv. Erica humbertii (H.Perrier) Dorr & E.G.H.Oliv. Erica humifusa Hibberd ex Salisb. Erica ibityensis (H.Perrier) Dorr & E.G.H.Oliv. Erica imerinensis (H.Perrier) Dorr & E.G.H.Oliv. Erica inclusa H.L.Wendl. ex Benth. Erica intermedia Klotzsch ex Benth. Erica involucrata Klotzsch ex Benth. Erica isaloensis (H.Perrier) Dorr & E.G.H.Oliv. Erica jananthus E.G.H.Oliv. & I.M.Oliv. Erica jugicola E.G.H.Oliv. & I.M.Oliv. Erica jumellei (H.Perrier) Dorr & E.G.H.Oliv. Erica klotzschii (Alm & T.C.E.Fr.) E.G.H.Oliv. Erica kraussiana Klotzsch ex Walp. Erica lecomtei (H.Perrier) Dorr & E.G.H.Oliv. Erica lehmannii Klotzsch ex Benth. Erica leptoclada Van Heurck & Müll.Arg. Erica leucoclada (Baker) Dorr & E.G.H.Oliv. Erica lithophila E.G.H.Oliv. & I.M.Oliv. Erica lyallii Dorr & E.G.H.Oliv. Erica macrocalyx (Baker) Dorr & E.G.H.Oliv. 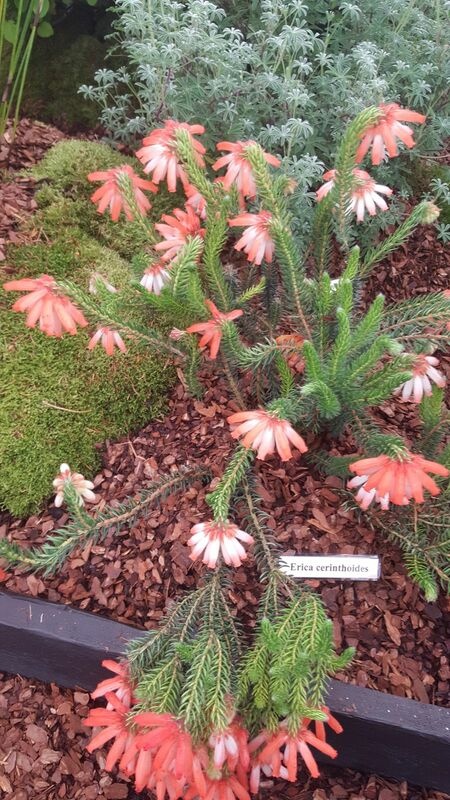 Erica macrophylla Klotzsch ex Benth. Erica maximiliani Guthrie & Bolus ex Schltr. Erica media Klotzsch ex Benth. Erica minutifolia (Baker) Dorr & E.G.H.Oliv. Erica minutissima Klotzsch ex Benth. 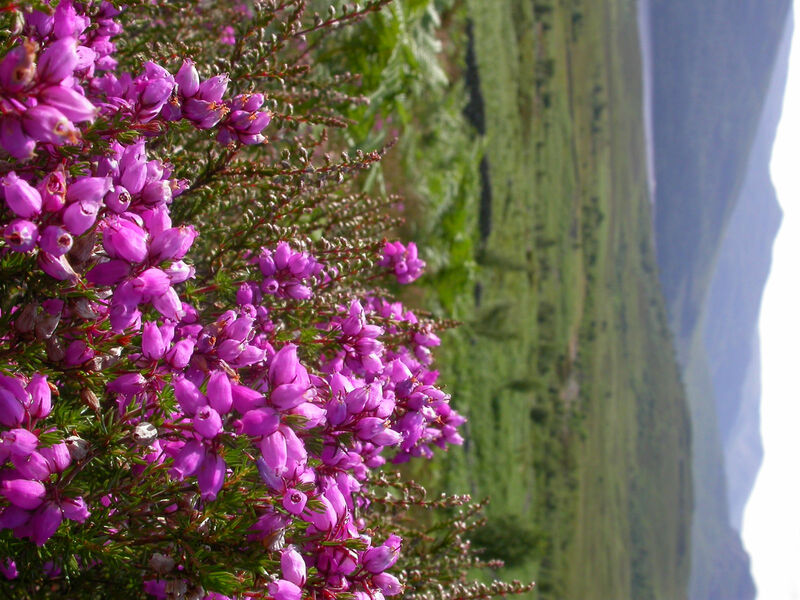 Erica myriadenia (Baker) Dorr & E.G.H.Oliv. Erica nemorosa Klotzsch ex Benth. Erica numidica (Maire) Romo & Borat. Erica nyassana (Alm & T.C.E.Fr.) E.G.H.Oliv. Erica opulenta (J.C.Wendl. ex Klotzsch) Benth. Erica ovina Klotzsch ex Benth. Erica parkeri (Baker) Dorr & E.G.H.Oliv. Erica pellucida Sol. ex Salisb. Erica perhispida Dorr & E.G.H.Oliv. 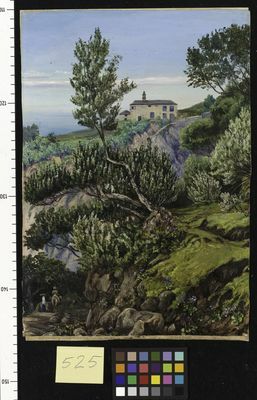 Erica perrieri Dorr & E.G.H.Oliv. Erica petrusiana E.G.H.Oliv. & I.M.Oliv. Erica platycodon (Webb & Berthel.) Rivas Mart. & al. Erica prolata E.G.H.Oliv. & I.M.Oliv. Erica psittacina E.G.H.Oliv. & I.M.Oliv. Erica quadratiflora (H.Perrier) Dorr & E.G.H.Oliv. Erica rakotozafyana Dorr & E.G.H.Oliv. Erica sagittata Klotzsch ex Benth. Erica schelpeorum E.G.H.Oliv. & I.M.Oliv. Erica sphaerocephala J.C.Wendl. ex Benth. Erica spinifera (H.Perrier) Dorr & E.G.H.Oliv. Erica stenantha Klotzsch ex Benth. Erica × stuartii (Macfarl.) Mast. Erica subterminalis Klotzsch ex Benth. Erica suffulta J.C.Wendl. ex Benth. Erica sylvainiana Dorr & E.G.H.Oliv. Erica tenuicaulis Klotzsch ex Benth. 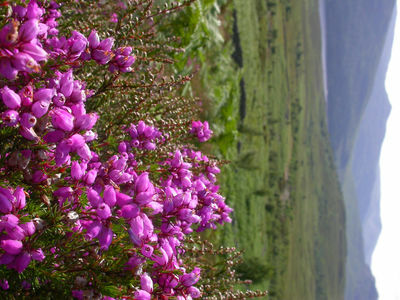 Erica thomensis (Henriq.) Dorr & E.G.H.Oliv. Erica trivialis Klotzsch ex Benth. Erica umbratica E.G.H.Oliv. & I.M.Oliv. Erica unilateralis Klotzsch ex Benth. Erica viguieri (H.Perrier) Dorr & E.G.H.Oliv. Erica virginalis Klotzsch ex Benth. Erica viridimontana E.G.H.Oliv. & I.M.Oliv. Nelson, E.C. (2011). Hardy Heathers from the Northern Hemisphere: 1-442. Kew Publishing, Royal Botanic Gardens, Kew. Geerinck, D. (2009). Révision du genre Erica L. (Ericaceae) en Afrique centrale Taxonomania 28: 6-16. Gen. Pl., ed. 5: 167 (1754).